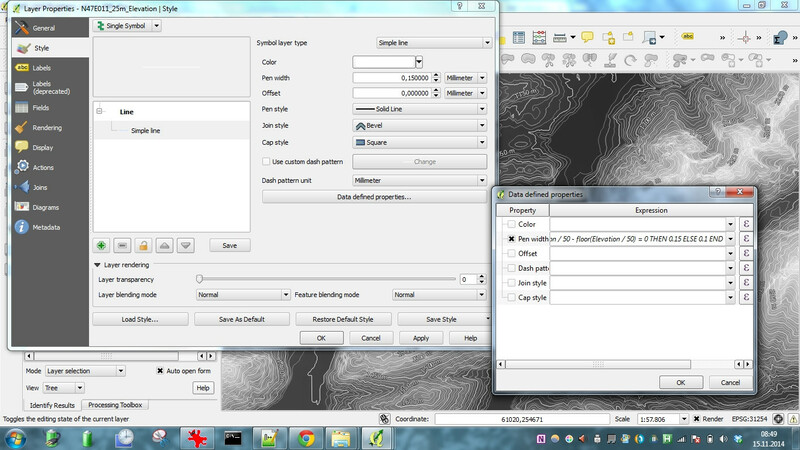 Choosing only one contour line to label in QGIS? Is it possible to select only one contour line for labelling? One approach would be to load the contour layer and style it. Then load the same layer again and apply a filter (right-click on the layer and go down to 'Filter..') Use a filter expression similar to the one shown in the picture. In my case I wanted major contours at vertical intervals of 50 metres and the field containing the elevation values was called "prop_value". When the filtered layer showing the major contours has loaded apply contour labels and (if required) strengthen the line style as shown. will also select contours at vertical intervals of 50 metres. 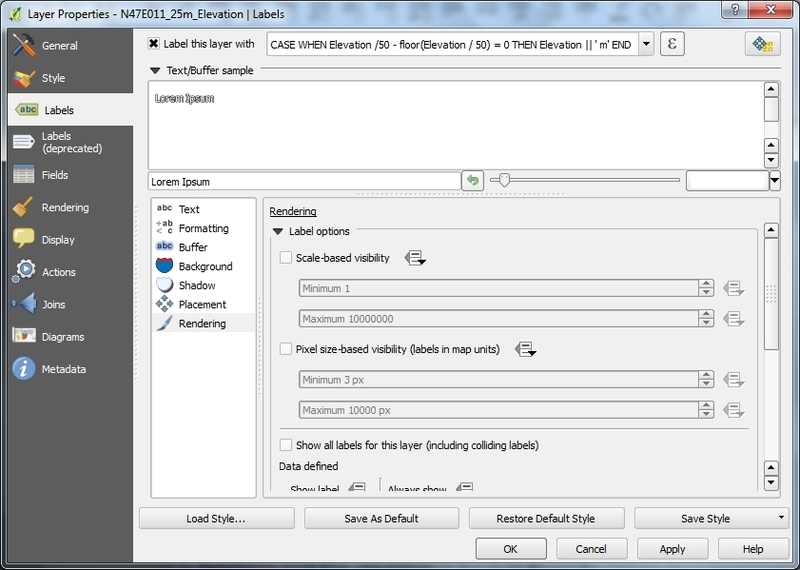 Works with Spatialite databases, not sure about shapefiles. I'm using this approach wich makes the labeling and display of contourlines by condition quite easy. I use the "Data defined properties" of the line symbol width and colors of the contourlines with an expression (see screenshot 1) by which you can apply different line widths based on custom conditions and a similar expression for labeling (see screenshot 2). Just put the needed values to the expressions and that's all. Another convenient expression is "ELEV" LIKE '%00' (step 100m) or "ELEV" LIKE '%00' OR "ELEV" LIKE '%50' (step 50m) or "ELEV" LIKE '%0' (step 10m) etc, where "ELEV" is my data elevation field. The second option works only if 50 is a multiple of interval (10m or 5m...). Not the answer you're looking for? 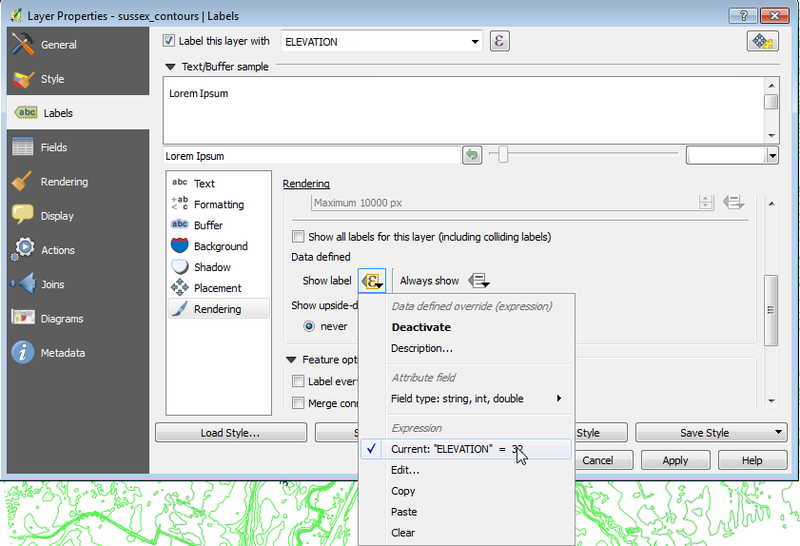 Browse other questions tagged qgis labeling contour or ask your own question. How to display only the negative contour labels? 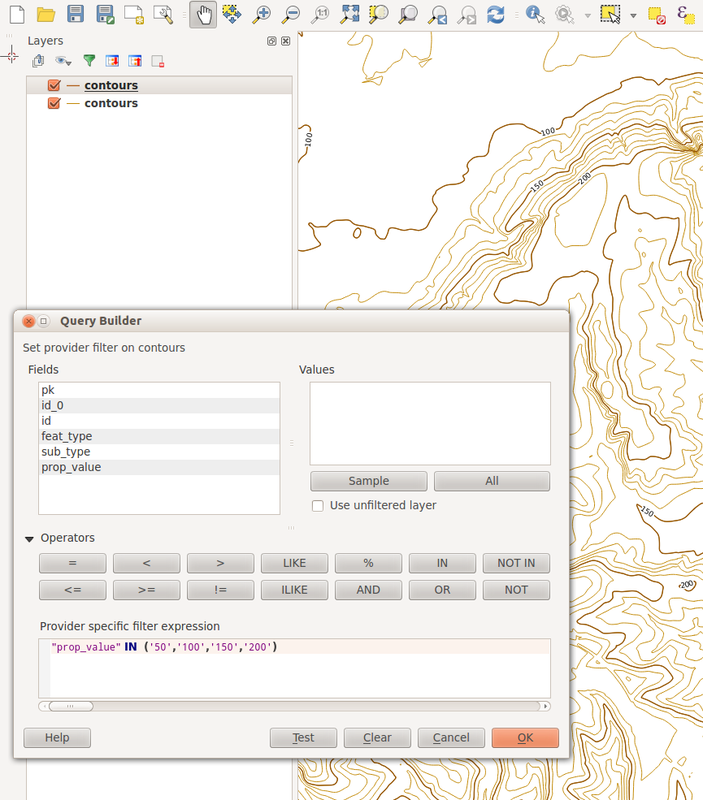 Creating index contours using QGIS? How to display only one representative contour line in legend? Label only selected features using QGIS? Placing contour line labels only beside polygons of another layer in ArcMap?